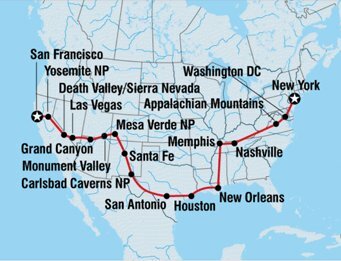 22 day cross country highlights - the Ultimate American Roadtrip! 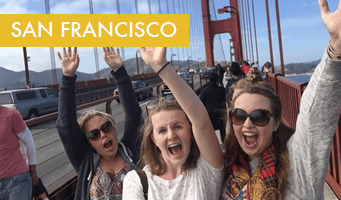 Travel across the States from New York City to San Francisco, discover some of America's best national parks, drive through Death Valley, roll dice in Las Vegas, be awed by the sheer size of the Grand Canyon, experience Navajo culture in ancient Monument Valley . Accommodation: Hotel (3 nts), camping with facilities (16 nts), hostel (3 nts). Meals:No meals are included. An optional kitty payment of $10 per day of your trip is used to pay for some. Budget: See trip notes for additional costs of meals not included, optional activities and personal spending.